Madison River Cabins and RV is located on the Madison River, which is famed for its excellent fishing and exquisite surroundings. We are also fortunate to be next door to the famous Grizzly Bar and Grill where you can take an evening off and enjoy a fine meal with great company. The Madison Bend, our general store, sells Montana-Made gifts and all your grocery needs. You can buy all the fixings for a great meal and cook in the comfort of your own private cabin, complete with cookware, dishes, and utensils. We also have a pro fly shop on site and fishing licensing. 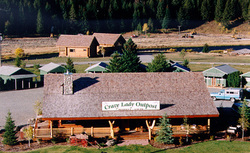 Madison River Cabins and RV offers the nicest cabins and facilities in the area at the lowest price. We hope you choose to give us the opportunity to serve you. For further information call 682-4890. Directions: Madison River Cabins and RV is located thirty-five miles north of West Yellowstone and thirty miles south of Ennis on US Highway 287. We are at mile marker 14, right next to the Grizzly Bar and Grill.